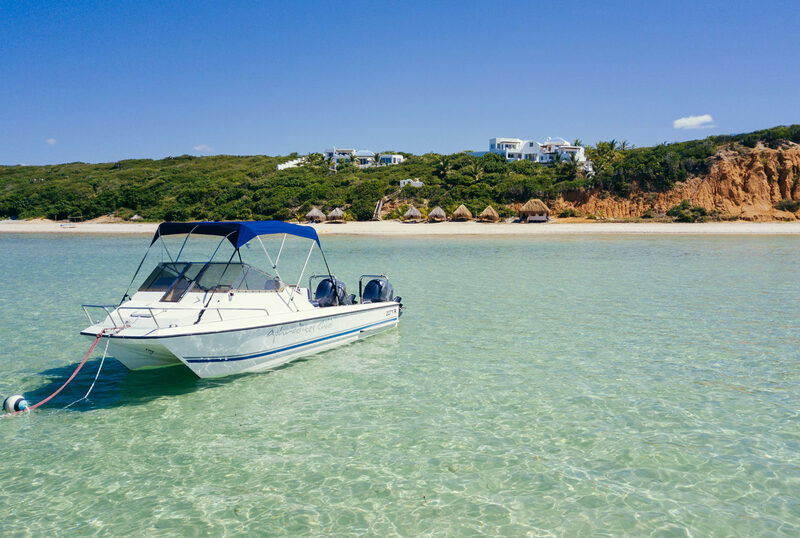 Set above the cliffs of Kingfisher bay on the Mozambique coast with views of the Bazaruto Archiplego and the ocean beyond, Santorini Mozambique is made up of a number of luxury villas and takes the form of a Greek village in amongst the Mozambiquan coastline it sits upon. Luxury at Santorini Villas goes hand-in-hand with a modesty that makes for a sophisticated and warm lodge. 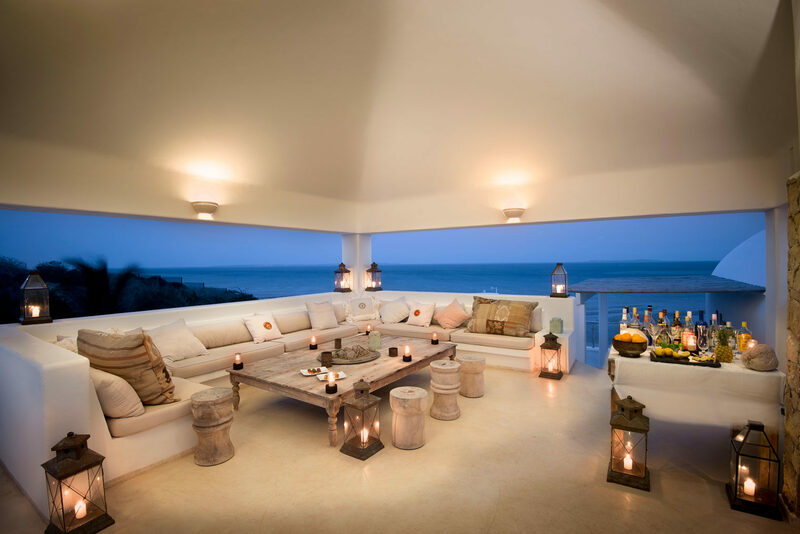 Originally a boutique villa, it exudes charm, and is made up of three villas spread along the beach. The Villas comes with number of swimming pools, both shared and private, and a large gift shop. 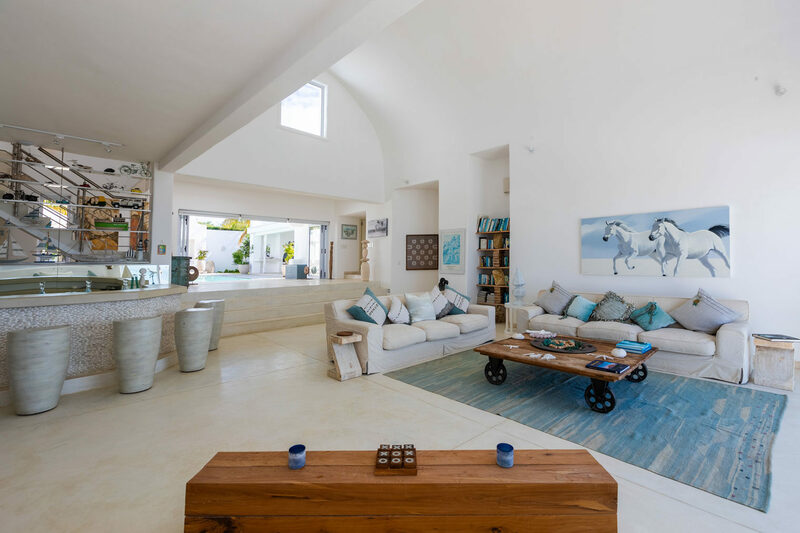 With chic-looking, white-washed walls, French windows, and minimalistic furniture, the look and feel of luxury indoors contrasts and complements nicely with the barefoot beach feel of the outside. Please note the WiFi functions throughout the Villas and a daily laundry service is available. Returning guests at Santorini Villas have commented on the service as being outstanding. Food ranges from western-style wholesome cereals, bacon, eggs and smoked salmon for breakfast through to stone-baked pizza, salads and fruit for lunch and fine, four-coursers for dinner, often based around the local catch of the day, all of which can be eaten privately on a veranda or in one of many shared areas, including the beach. 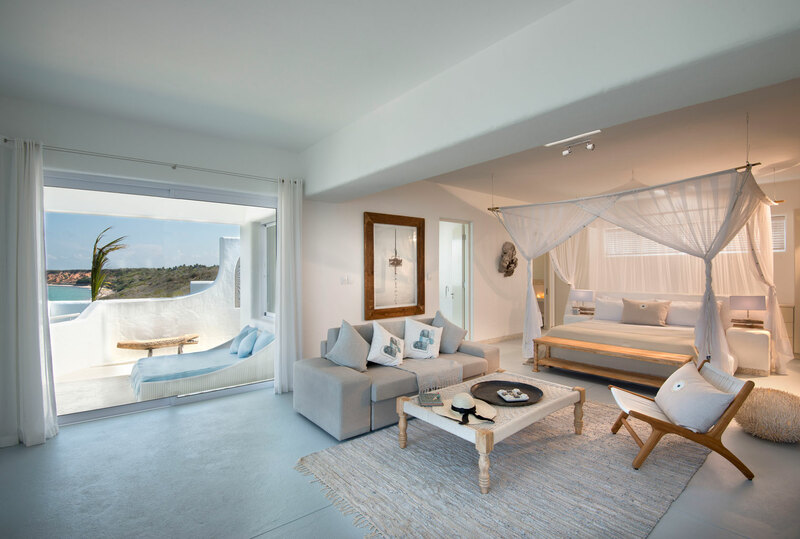 The various villa suites at Santorini Villas range from between 25 and 50 square metres, all with fourposter king-size beds with mosquito nets and an airy by-the-sea feel. 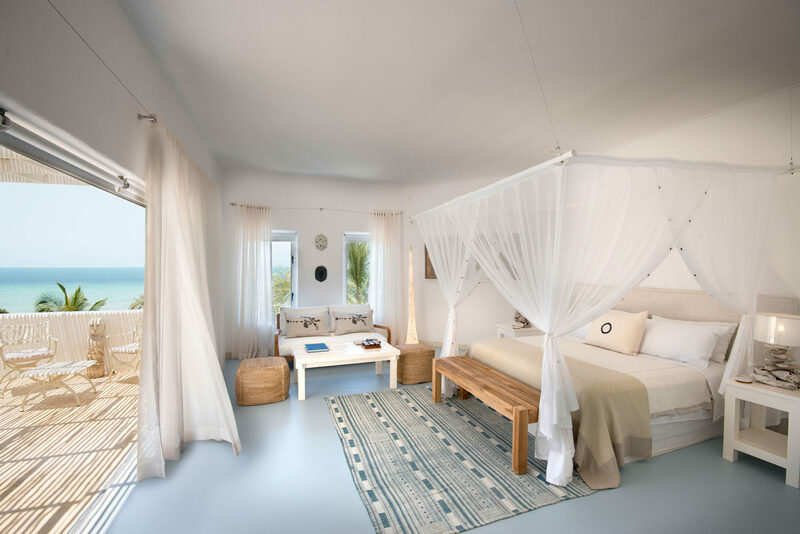 Each is stylised with whitewashed walls and driftwood furnishings, with large en-suite bathrooms (some with both indoor and outdoor showers) and verandas looking over the Indian Ocean. There are 10 suites in total. The main villa is made up of five suites, between which sits a sprawling network of corridors with various large lounge areas, indoor and outdoor dining areas and kitchen equipped with barbecue and pizza oven. The Chapel has two suites, a large lounge, a bar re-stocked daily and a swimming pool with sun loungers out the front. 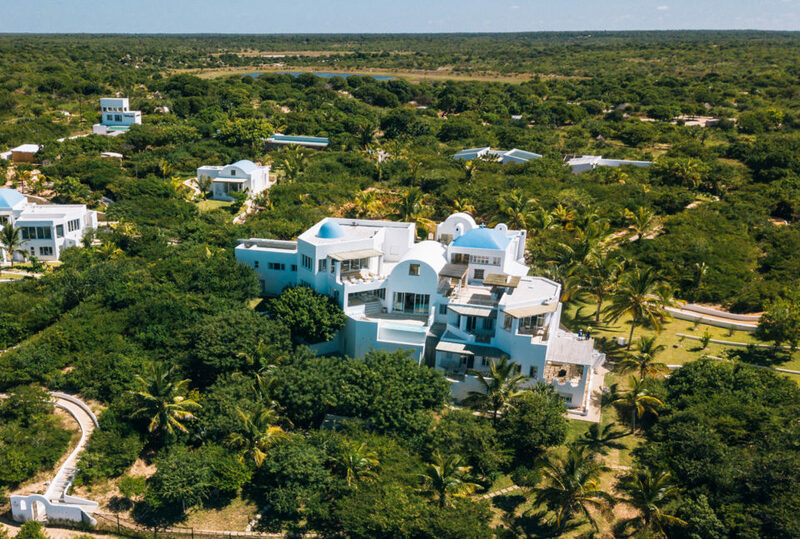 Villa Da Praia includes three suites, each with outdoor showers overlooking the Indian Ocean; two suites have a private veranda, while the third comes with a manicured garden and private entrance. 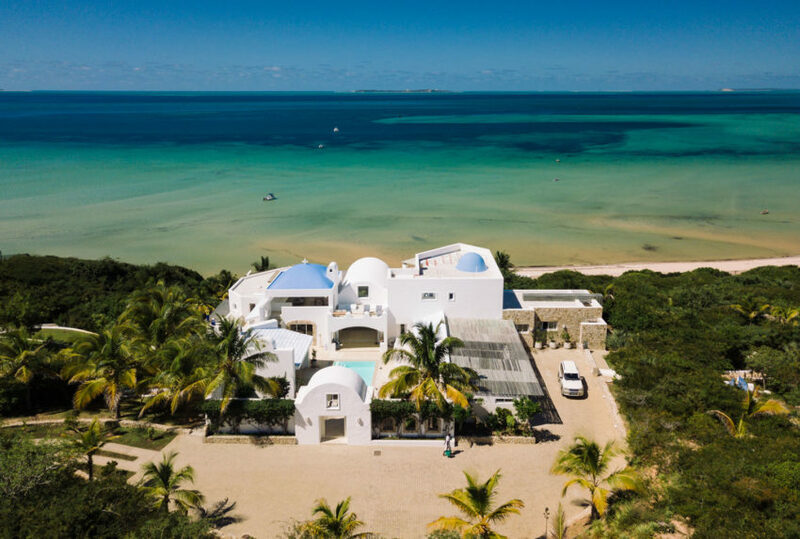 Both the Chapel and Villa Da Praia are available for exclusive use. 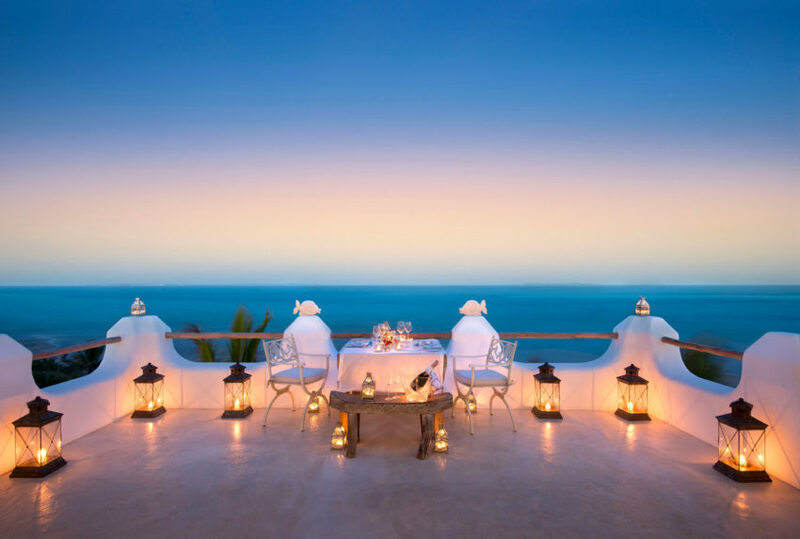 The activities at Santorini Villas are legion, and include anything from boat charter and dhow expeditions to sea fishing, quad biking, scuba diving, kite surfing, horseback safaris and scenic helicopter flights. Child-minding is also available for families and kids often find themselves sandboarding down dunes, rock pooling, fishing and kayaking around nearby islands. A community driven conservation project titled ‘Plastic Free Vilanculos’ aims to eliminating plastic and other waste from the surrounding sea, beaches and roads. The project includes providing stewardship for sections of the beach, organizing ongoing beach clean-ups, liaising with government authorities and fisherman and discussing recycling methods. Santorini’s vegetables and herbs are from the their own garden, and this has inspired a local vegetable programme which encompasses neighbouring villages. Santorini supports a locally organised community project group called LUZ, who rely on donataions to carry out their vital work. Current projects include water pump instillations, animal vaccination programmes, and raising awareness & education for HIV/Aids. The camp is also a proud member of Pack for a Purpose, an initiative that encourages guests to bring school supplies with them when visiting.